What is Simple Harmonic Motion (SHM)? 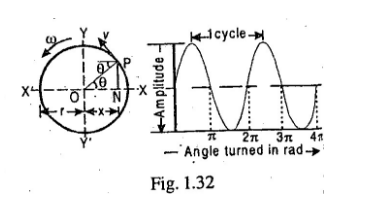 Amplitude, Frequency and Periodic Time of a body moving with SHM? 2. Its acceleration is proportional to the distance from that point. 1. Amplitude :- It is the maximum displacement of a body from its mean position. In Fig. 1.32, OX and OX’ is the amplitude of particle P. The amplitude is always equal to the radius of the circle. Note : In S.I. units, the unit of frequency is hertz (briefly written as Hz) which is equal to one cycle per second.